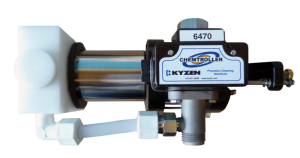 KYZEN’s Chemtroller is reliable, simple to use and works on a special water-driven proportioning pump for hands-free chemistry additions. Requiring no electricity or compressed air connections, the incoming water pressure powers the positive displacement pump. Just set the desired ratio and when the wash tank calls for make-up, both chemistry and water are added automatically. The Chemtroller is constructed of stainless steel and HPDE for superior chemical compatibility, long life, and operating temperatures up to 180°F / 82°F. Several models are available with dosing ranges from 0.8% to 25%.